Georgia gubernatorial candidates (L-R) Democrat Stacey Abrams, Republican Brian Kemp, and Libertarian Ted Metz debate at Georgia Public Broadcasting on October 23. Soon after an old Atlanta Journal-Constitution article resurfaced reminding people that Democratic gubernatorial hopeful Stacey Abrams had, in the early 1990s, burned a State of Georgia flag in protest, and mere hours after Rolling Stone released a secret recording of Republican contender Brian Kemp saying he was worried about his opponent’s efforts to get voters to the polls, the Peach State’s heated governor’s race brought both candidates and Libertarian Ted Metz to the debate stage for the first time. But the competition is more nuanced than that. In fact, the president’s name wasn’t evoked once during Tuesday’s debate. The race between Kemp and Abrams has been dominated for months by debates about voters’ rights and access, mired in controversy surrounding the alleged vulnerability of Georgia’s elections system and supposed voter suppression, as well as calls from Democrats that Kemp, as the current secretary of state, shouldn’t be able to oversee an election that has his name on a ballot. 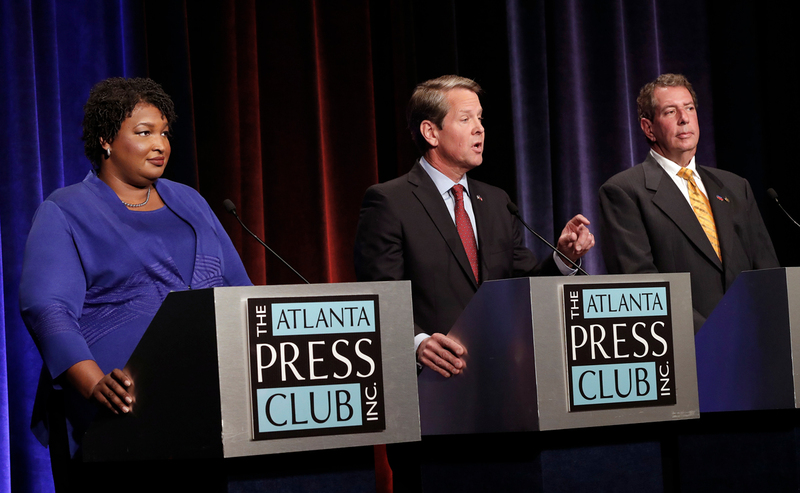 Tuesday’s debate, hosted by the Atlanta Press Club and aired on Georgia Public Broadcasting, was likewise heavy on the topic, and, after a brief, impromptu intermission—a fire alarm temporarily interrupted the first round of questions—Kemp, Abrams, and Metz sparred over all things elections policy, as well as education and healthcare. Kemp lashed out at Abrams for supposedly recruiting illegal immigrants to cast ballots. But that’s just not the case, retorted Abrams, who has suggested undocumented immigrants were part of the “Blue Wave” of liberals that will help carry Democrats into office. She later clarified that she never encouraged anyone who’s not eligible to vote. Abrams said that any student who graduates from a in-state high school, including DACA recipients—many of whom pay taxes and have social security numbers—should be able to utilize HOPE benefits and enroll at the Georgia’s top schools. Metz posited that there should be a better avenue for immigrants to become citizens. “If we don’t have more people in Georgia and the United States to pay into our Medicare and Medicaid systems, those systems will collapse,” he noted. On healthcare, Abrams reiterated her promise to expand the Medicaid program in Georgia, claiming that doing so would help prevent hospitals in rural areas from shuttering. “With the expansion of Medicaid, we can save more hospitals, cover more than half a million Georgians, and invest in all of those communities to the tune of $3 billion, including the creation of 56,000 jobs,” she said. Kemp said Abrams’s game plan for healthcare “will make your current insurance plan illegal,” adding that she’d raise taxes to foot the bill for Medicaid expansion. He asserted that Georgians need to trust their healthcare providers, which Abrams took as an absence of real policy plans. Then, of course, there was more discussion regarding how trustworthy Georgia’s elections system is. Asked about progressives’ frequent calls for Kemp to step down from his elections czar post—and whether he’d recuse himself from involvement should a recount request arise—the Kemp said, “I took an oath of office to serve as secretary of state and that’s exactly what I’m going to continue to do.” He added that “very competent” county elections officials—“local, bipartisan elections boards”—would automatically tackle recount procedures. “I’m doing the exact same thing that Democrat Cathy Cox was doing when running for governor [in 2006],” he added—she kept her secretary of state title then—although Kemp didn’t specifically say whether he’d recuse himself from participation in the possible recount process. Abrams claimed that, under Kemp’s leadership, “More people have lost the right to vote in the state of Georgia,” nodding to the report that more than 53,000 voters had been placed on “pending” status thanks to a relatively new law that requires registration paperwork to match documents held by Georgia’s Department of Driver Services and Social Security Administration office. Volleyed Kemp: “We have more voters on the roll than when I took office . . . we’ve made it easier to vote and harder to cheat. This farce about voter suppression and people being held up on the voter rolls is absolutely not true . . . all [the pending voters] have to do is go to a voting location and show a picture ID,” he said. Surprisingly, there was no mention during the debate of a new Rolling Stone piece, which showed that Abrams’s efforts to recruit new voters has “concerned” the Kemp campaign, according to a secret recording obtained by the publication. Abrams’s “unprecedented turnout” of absentee ballot requests, said Kemp at a private fundraiser in Buckhead on October 19, “continues to concern us, especially if everybody uses and exercises their right to vote—which they absolutely can—and mail those ballots in, we gotta have heavy turnout to offset that,” according to a recording obtained by the publication. During the primaries, a surge in the Democrat’s voter base became cause for concern among Georgia Republicans who have become accustomed to maintaining a significant majority in the state House and Senate. Historically, Republicans bring over 200,000 more voters to Georgia elections than do Democrats. Last spring, however, the Blue party shrunk that margin to around 54,000 heads—a steep jump that’s complemented by near neck-and-neck status in recent polls. Of course, a recently revived headline about a young Abrams participating in a State of Georgia flag burning in 1992—when the flag featured the Confederate battle flag, adopted in 1956 in response to school desegregation—earned a question from the debate panel, although Abrams was quick to dismiss any controversy surrounding the matter. There was also plenty of back-and-forth about who owes who money. Kemp jabbed at Abrams for owing tens of thousand of dollars in back taxes. She said she opted to help out her family—her parents were afflicted by Hurricane Katrina and her father was diagnosed with cancer—and deferred paying her taxes, adding that she’s now on a payment plan with the IRS, before jabbing back at Kemp, saying he’s dealing with a lawsuit from farmers who claim the secretary of state owes them half a million dollars. An Atlanta Journal-Constitution investigation found “nothing [in Department of Agriculture records] suggests Kemp was directly involved in AgStrong’s [an agriculture company that Kemp invested in] questionable business dealings.” No new ground was made. The second and final gubernatorial candidate debate will be held on November 4, just two days before the general election, and air on WSB-TV. Who stands to lose the most under Georgia’s anti-abortion bill?